Whether you have a playful puppy or a sedentary senior, dogs of all ages and breeds can learn new tricks. Everyday commands like “sit” and “stay” are important when teaching basic manners — and for keeping your pooch out of trouble — but your canine companion is capable of all sorts of other crowd-pleasing feats. And dog tricks aren’t just a fun way to entertain houseguests; experts say both dogs and their humans benefit greatly from the trick-training process. We turned to the pros to get some tips and, er, tricks for how to teach a dog tricks. Teaching a dog tricks isn’t impossible or even difficult. Photography courtesy World Dog Expo. But whether you want to teach Rover to retrieve your newspaper from the end of the driveway — or to simply come when called — there are definitely some tricks to the trade. “Try to follow the mantra: ‘cue, action, reward’… and remember that timing is everything, because that reward must be given at the exact moment your dog delivers the action you’re looking for,” explains Chrissy Joy, a trainer at BFF Pet Services in Maryland whose dog, Beasley, is the 2018 National Stunt Dog Champion. Along with keeping training sessions short and minimizing distractions as much as possible, Joy notes that your four-legged friend is going to need a ton of positive reinforcement during the learning process. That means plenty of verbal praise (“good girl!”), head scratches and, of course, yummy treats. “One of the most common mistakes people make is trying to use dog kibble or being too stingy with treats, but in the learning phase, you want to use the good stuff — chicken, cheese, ham — or anything your dog would really enjoy will keep him motivated to learn,” Sundance adds. According to Joy, a dog’s drive to hunt makes spinning in circles a trick that any dog can learn. “You can use your dog’s natural inclination to rely on his nose to find prey into luring him to move in all sorts of ways,” she explains. Let your dog sniff out a treat in your hand. Encourage your dog to follow his nose to spin in a circle, and reward him with the treat. You don’t even need a tunnel for this trick! Photography courtesy Kyra Sundance. Don’t worry, you don’t actually need a tunnel for this trick — a row of chairs works just fine. “It’s a really fun trick but also a great canine conditioning exercise,” Sundance says. Use a treat to lure your dog to get down on his belly and crawl under a chair (it should look like army crawling), then reward. Add an additional chair and repeat the first step. 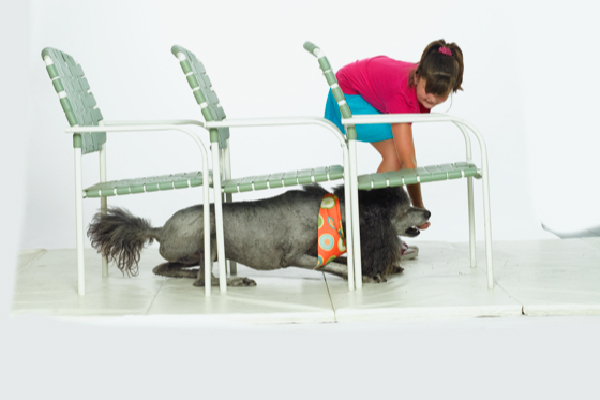 Keep adding chairs and gradually move the treat farther away from the end of the row of chairs so your dog learns to crawl completely through the “tunnel” to earn his treat. Teaching your dog to high-five is fairly simple! Photography ©andresr | E+ / Getty Images. Reach for her paw and reward with a treat for completing the handshake. 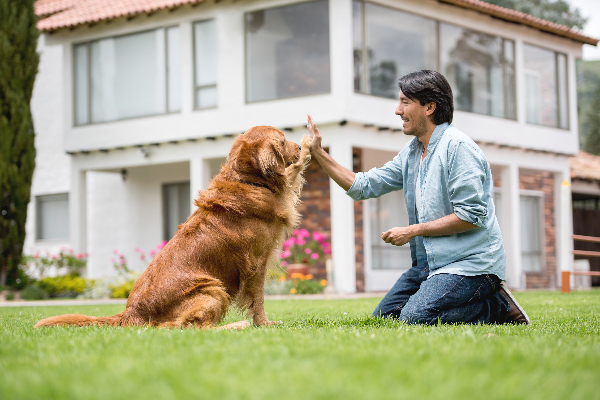 The same steps can be applied for a “high-five” command; hide a treat in your fist and try to get your dog to paw at your hand while using the “give a high-five” cue, eventually opening up your fist and rewarding your dog for pawing your open palm. Put your dog in the “down” position. Continue the motion until his body fully rolls over, then give the reward. “One of Beasley’s more unique and entertaining tricks is acting shy by covering his eyes … it’s definitely a crowd-pleaser,” Joy says. Place a small piece of masking tape on your dog’s nose. 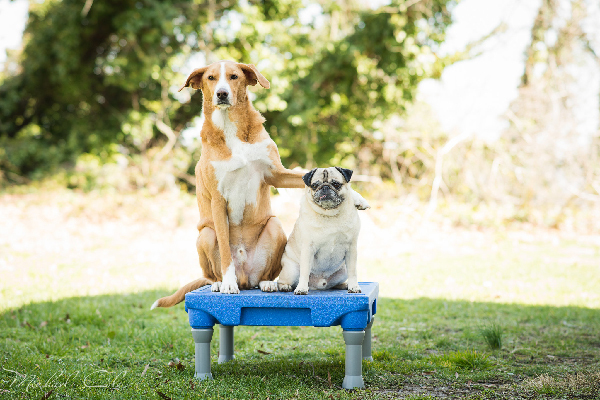 Most dogs will immediately attempt to bat off the tape with their paw; as the dog brings her paw to her nose, use a cue like “good shy” and reward the behavior. Repeat until your dog understands the command without using tape and will react to the word “shy” (such as “Don’t be shy”). 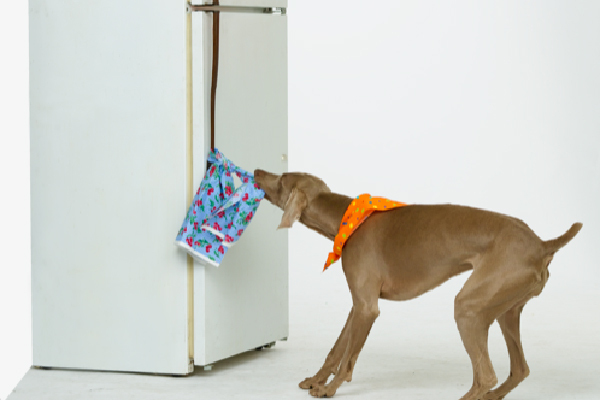 Teaching a dog to get a drink from the fridge is a little more difficult — but it can be done! Photography courtesy Kyra Sundance. While this is definitely a more advanced trick, the use of an especially tasty treat and a lot of patience and repetition can make it happen. Your dog should already know the commands for “fetch” and “drop,” and you may want to first use those commands to teach your dog to play fetch with an empty can of soda. Insert a piece of hot dog or another delectable treat into the knot at the end so the dog is attracted to the towel and learns to pull on it to retrieve his treat. Repeat command and reward with praise and additional treats for pulling on the towel and opening the door. Use the command for “fetch” while pointing to the soda can. If needed, place the can in the dog’s mouth while using the cue, and reward with a treat. Use the “drop” command to encourage your dog to place the drink into your hand. Reward this action with treats and praise. Continue moving farther away from the refrigerator while giving these commands. Thumbnail: Photography ©Bill Chizek | iStock / Getty Images Plus. Tell us: What are your tips for how to teach a dog tricks? The post Wondering How to Teach a Dog Tricks? Our Step-by-Step Guides appeared first on Dogster.